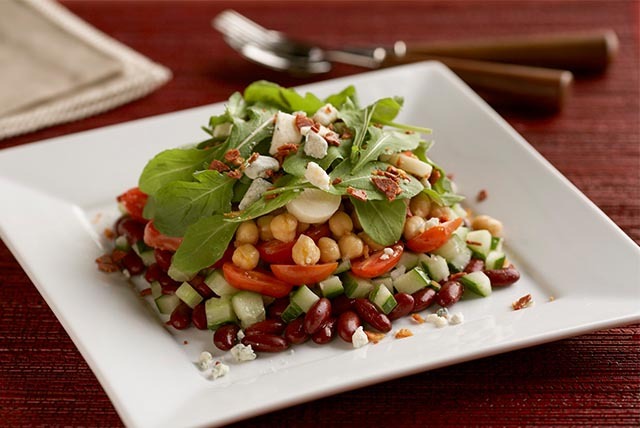 This version of a bean salad is made by layering kidney beans, cucumber, tomatoes, chickpeas and arugula and topping with leeks, blue cheese and bacon. This salad makes for a beautiful presentation so be sure to serve it at your next dinner party with friends. Add leek rings to saucepan of boiling water; cook 2 to 3 min. or just until crisp-tender. Drain, then immediately plunge into cold water to stop cooking. Layer ingredients on individual serving plates. Drizzle with dressing just before serving. Swap out the kidney beans and chickpeas for the canned beans you like best. If you don’t like blue cheese, try goat cheese for an easy substitute.